2016-08-31 - In the Month in a Big Way! I love the big crowds. 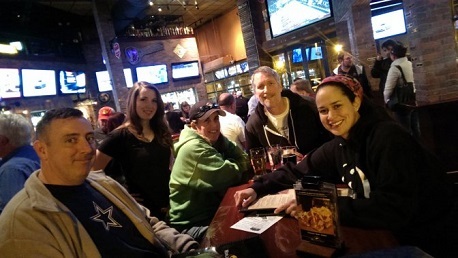 It lets us know how much you guys enjoy trivia and it certainly makes for a fun evening. Wednesday night was no different. We welcomed several new teams, Slow White Bronco and I Got Fired Today. We also welcomed back many returning teams, some still new like Team Name Here and some we haven't seen in a while, What the Hell is a Razzleberry!?. And of course, we had our usual contingent of teams we see weekly, Quiz in My Pants, Cobra Kai, the Mouseaholics, and John PLCena!. It was a fantastic night for trivia and a great way to say goodby to August. In Game One, John PLCena! simply dominated. They won convincingly over the rising stars of Team Name Here. For the Power Hour, with the help of many musical bonus points courtesy of Green Day and armed with considerable knowledge of Henry VII's wives and College Football conferences, Quiz in My Pants came from behind to claim the top prize. Finishing a single point behind for second place was John PLCena!. Now, for that scavenger hunt bonus point. In honor of college football starting up, let's have some fun. Multiply that number by the total number of passing touchdowns thrown by Texas Tech against SFA. Add the total number of passing yards (per ESPN) gained by Texas Tech against SFA. That gives you a number that corresponds to a year. Tell me who won the Heisman Trophy from that year.